So Who Is Grandma, Really? Hi! I'm Donna aka Grandma! Or NeeNie as my grandchildren call me. I thought you might like to know a little bit about Grandma. Yes, I really am a grandmother. The grandchildren I mention on various pages throughout this site really do exist. They are the sunshine of my heart! My grandson, now 4 years old and my two year old granddaughter, have brought a new dimension to my life that is so hard to describe. The sheer joy they bring me is totally amazing! Having children in your life is such a special gift, whether their your own children, your grandchildren, step children, It doesn't matter. Everyday is a new adventure with them. Their constant learning and changing is so exciting, not to mention that unconditional love! I want very much to spend as much time as possible with them. 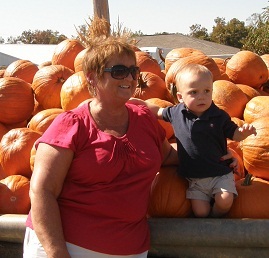 We've learned many of the nursery rhymes on this site together, learned many of the activities, made lots of crafts, or projects as my grandson likes to call them. We've sang nursery rhyme songs like Twinkle, Twinkle and The Wheels on the Bus. Sometimes to the dismay of their parents. They've been my inspiration for my website. This website gives me the opportunity to share with all of you a love of my grandchildren, nursery rhymes, creativity and fun. I hope you enjoy the site, whether seeking verses to share with your special little one, looking for nursery rhyme costume ideas or decor for your little one's nursery. I am adding to the site every week, so please check back often or sign up for my newsletter. I'll alert you to new articles on rhymes, games, costumes, decor, baby showers or whatever else I discover related to those fabulous Mother Goose Nursery Rhymes. So how did grandchildren get me here? Read our story and find out how you too can find a new path in life that allows you to work at something you truly enjoy, have time to spend with those that you love and still have an income.